The constellation of Orion is popular among winter stargazers in the northern hemisphere. It is easily identifiable by three bright stars that form the belt of Orion. Slightly below the belt is a fuzzy region known as the Orion Nebula. It is about 1,300 light years away, which is relatively close in astronomical terms, and it is an active stellar nursery. It is thought that all stars, including our Sun, were produced in stellar nurseries, where vast quantities of gas and dust come together to produce hundreds of stars at a time before galactic rotation and intense stellar winds rip the nebula apart. But new observations of the Orion Nebula find that stellar nurseries could produce stars in multiple waves rather than a single burst. Using data OmegaCAM, which is a wide angle optical camera at Paranal Observatory, a team looked at more than 200 pre-main sequence stars. That is, stars that are only a few million years old and are still in the process of settling down into a stable (main sequence) star like our Sun. 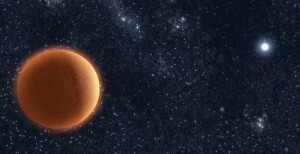 They measured the apparent brightness of these stars in both visible and infrared wavelengths, and used this data to compare brightness and temperature. Very young stars heat up as they age, so this comparison allows astronomers to estimate their age. They found these stars didn’t cluster around a similar age, but were instead grouped into three clusters, each a few hundred thousand years apart. This would imply that star formation within the Orion nebula occurred in multiple waves rather than all together. If true, this would be a surprising result, and could force astronomers to reassess the details of stellar formation models. The distribution of stars within the Orion nebula for each age group. Credit: G. Beccari, et al. But determining the ages of very young stars is difficult, and some research has shown that the luminosity-age relation isn’t always reliable. Stars do heat up over time, but this can be greatly affected by things such as the rate at which the star accretes material. 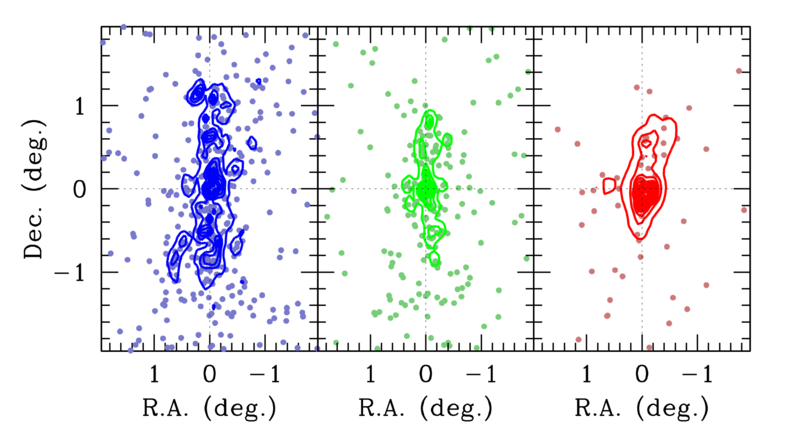 The apparent clustering of stars could be due to stars heating up at different rates, rather than being different ages. So the team looked at another method to estimate the age of stars, specifically the rate at which stars rotate. Early on, a young star can rotate rapidly, but they slow down as they reach the main sequence. If the clustering effect is due to age, one would expect star in the youngest group to rotate more quickly than stars in the oldest group. This is exactly what the team found, further confirming that the Orion nebula has had multiple waves of star production. The team also looked at the distribution of these stars within the Orion nebula, and found them to be located within similar regions. This means that the stars did not form within distinct regions of the nebula. It seems clear that the Orion nebula has gone through active and quiet periods of stellar formation over the past few million years.